Polyurea coatings are derived from the reaction of isocyanate components and resin-blend. isocyanate components can be aromatic, aliphatic, polymer, or monomer. Products from the polyuria coatings have a wide ranging applications as these coatings are solvent-free and non-toxic. Their unique qualities such as temperature stability, favorable adhesion strength, high elongation, and water resistance are highly useful for crack bridging. Growing infrastructure developments in many parts of the world are expected to drive growth for the polyurea coatings marketduring 2018-2026. The polyurea coatings markethas been divided into hybrid polyuria and pure polyurea. In terms of total revenue share, the hybrid polyuria segment is predicted to show major growth during the forecast period. The hybrid polyuria coating, due to its low cost and equivalent extent of application is expected to register significant growth for the polyurea coatings marketduring 2018-2026. Due to growing infrastructure developments, these coatings are growing in demand. The products from the polyurea coatings marketare widely used in waterproofing concrete and for providing protection against salts, water, and chemicals. Without these coatings, chemicals can cause substration and result in significant damage to concrete structures. This critical application is a key reason for growing demand for polyurea coatings marketproducts. Additionally, polyurea coatings marketproducts also have a wide range applications. These include bridges, manhole interiors, wastewater treatment plants/holding basins, parking deck structures, exterior basement waterproofing and potable water containment. Hence, the low costs of hybrid polyuria coatings are expected to propel the polyurea coatings marketin the near future. The polyurea coatings market has been bifurcated into pouring, spraying, and hand mixing, based on technology. Among these, spraying is expected to drive strong growth for the polyurea coatings marketas compared to others. The method is widely popular due to machine-based spraying which is more efficient and ideal for large scale infrastructure projects. The machine-based spraying is expected to result in significant revenue growth for the polyurea coatings market in the near future. Additionally, construction industry faces problems with intercoat adhesion. These are often related to low quality of raw materials, manufacturing, and spray equipment. Innovations in the machine-based coatings are proving to be effective in solving these challenges. Today, innovations in machine-base spraying can solve most problems related to poor mixing with changes in machine settings. These advancements in machine-based coatings are expected to register significant growth for the polyurea coatings marketduring the forecast period. The building and construction sector is witnessing a major expansion in Asia Pacific region, which is expected to brighten future prospects for the polyuria coatings market. 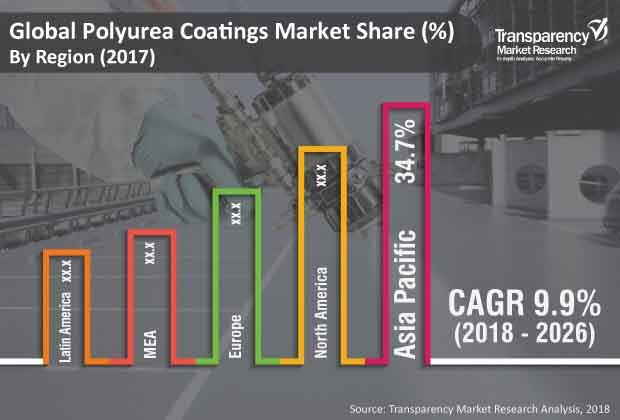 Due to looming infrastructure renovation projects in the US, the polyurea coatings marketrevenue share is expected to gain a major boost during the forecast period. Additionally, Asia Pacific countries such as India, Mynmar, and Vietnam are witnessing public and private initiatives to improve infrastructure considerably. These are expected to result in more demand for polyuria coatings in the region in the near future. The key application of polyuria coatings and rising demand from the Asia Pacific region is expected to open bright prospects for all players in the polyuria coating market during 2018-2026. A competitive vendor landscape exists in this market due to the establishment of numerous players. Some main players in the polyurea coatings market include Huntsman Corporation, Albemarle Corporation, PPG Industries Inc., Nukote Coating Systems International, Covestra AG, BASF SE, and The Sherwin-Williams Company. Polyurea coatings are capable of holding two surfaces together in a strong and permanent manner. They are employed for their holding and bonding power. Polyurea coatings are materials with high shear and tensile strength. They join substances of different geometrics, sizes, and composition. They eliminate corrosion when associated with metals. These coatings do not produce any deformation in materials by eliminating the metal grinding process. Polyurea coatings do not produce any mechanical aggression to the substrate and avoid damage to the structure of the material. They improve flexibility in product design and esthetics. Polyurea coatings provide sealing and protection against corrosion. In terms of type, the polyurea coatings market has been bifurcated into pure polyurea and hybrid polyurea. Based on technology, the polyurea coatings market has been divided into spraying, pouring, and hand mixing. In terms of application, the market has been segregated into building & construction, transportation, industrial, and landscape. In terms of raw material, the polyurea coatings market has been classified into aromatic-based and aliphatic-based. The aromatic-based segment dominated the polyurea coatings market in 2017, as these coatings are durable and are used to coat automotive part surfaces. These coatings possess corrosion resistance properties and are used in pipe linings, pump stations, wet wells, digesters, clarifiers, and manhole lining applications. Based on region, the global polyurea coatings market has been split into North America, Europe, Asia Pacific, Latin America, and Middle East & Africa. North America held prominent share of the global polyurea coatings market in 2017. The U.S. accounted for a major share of the polyurea coatings market in North America in 2017 due to the rise in demand for polyurea coatings in end-user industries such as building & construction, transportation, industrial, and landscape in the country. Expansion in the residential construction industry in the U.S. and the ongoing renovation activities of buildings are expected to drive the market in the near future. The report analyzes and forecasts the polyurea coatings market at the global and regional levels. The market has been forecast in terms of volume (thousand liters) and revenue (US$ thousand) from 2018 to 2026. The study includes drivers and restraints of the global polyurea coatings market. It also covers the expected impact of these drivers and restraints on demand for polyurea coatings during the forecast period. The report also highlights growth opportunities for the polyurea coatings market at the global and regional levels. The report comprises detailed value chain analysis, which provides a comprehensive view of the global polyurea coatings market. The Porter’s Five Forces model for the polyurea coatings market has also been included to help understand the competition landscape. The report also includes the analysis of various type, technology, application, and raw material segments based on their market size, growth rate, and segment attractiveness. These segments have been analyzed based on the present and future trends. Regional segmentation includes the current and future demand for polyurea coatings in North America, Europe, Asia Pacific, Latin America, and Middle East & Africa. The report also covers segmentation based on individual type, technology, application, and raw material segments of the market in all the regions. The study includes profiles of major companies operating in the global polyurea coatings market. Key players profiled in the report are Albemarle Corporation, Huntsman Corporation, Unquote Coating Systems International, PPG Industries Inc., The Sherwin-Williams Company, Covestra AG, BASF SE, Rhino Linings Corporation, Duraamen Engineered Types Inc., and Zhuhai Feiyang Novel Materials Corporation Limited. Market players have been profiled in terms of company overview, business strategies, and recent developments. The report provides size (in terms of volume and value) of the polyurea coatings market for the base year 2017 and the forecast for the period between 2018 and 2026. The size of the global polyurea coatings market has been provided in terms of volume and revenue. Market numbers have been estimated for type, technology, application, raw material, and regional segments. The market size and forecast for each type, technology, application, raw material and regional segment have been provided for the global and regional markets.